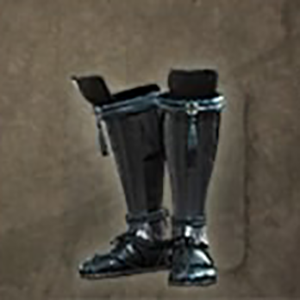 General of Kugetsu's Armour: Suneate is a Foot Guards in Nioh. "Greaves made from iron plates bent into curves, painted in black lacquer and affixed to leather. The sky blue lacing is a simple design adition that invokes images of shooting stars. Part of a traditional armour set known as Tosei-gusoku in Japanese, this armour was owned by Yamanaka Yukimori (also known as Shikanosuke) who served the Amago clan of Izumo province (present-day eastern Shimane prefecture). After the Amago clan surrendered to the Mohri, Yukimori burned with the desire to restore his clan to its former greatness and became known across the San'in region as a man of exceptional talent. Legend has it that he once prayed to a crescent moon to bring down upon him seven misfortunes and eight hardships in exchange for military valour."